Now, first we install the express web framework, and then we start implementing different template engines in our node.js application. First, create a node.js project directory. Now, go inside the folder and initialize the package.json file. Next step is to install the express framework. Now, create a file inside the root called server.js and add the following code. 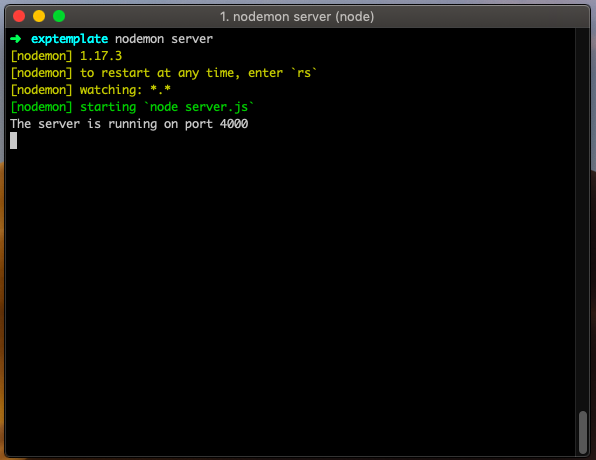 We can use the nodemon server for development. So let us install it using the following command. Okay, now install our First templating engine Pug using the following command. Create one folder inside the root called views. Now that Pug is installed set it as the templating engine for your app. You don’t need to ‘require’ it. Add the following code to your server.js file. Here, we have defined the template engine Pug. Also, we have defined the directory from which these template files can load in our application. So, when the request comes from the client, it will go to the router and then router redirect to one of the pages inside the views folder, and then that page will be rendered. Next step is to create a file inside the views folder called template.pug and add the following code. p.greetings#peopleHello Hello From Pug Templating Engine! It is the pug syntax to write the HTML. To run this page, add the following route to your server.js file. So, our final server.js file looks like below code. Save the file and see the console, if we are running with errors and then if not then make sure your nodemon server is running. If everything looks great, then go to the browser and switch to the following URL. You can see that our HTML is rendering and we have successfully integrated the Pug templating engine. We can use the Mustache templating engine in Express; you first install the mustache-express package. Now, require and configure the module. I have written the final server.js file for implementing the mustache-express module. Also, we need to create a file inside the views folder called index.html and write the following HTML code inside the index.html file. Save the file and go to the browser and navigate to the following URL. You can see that we have successfully integrated the Mustache template in Express. Now, import the ejs template as well as configure the ejs template. Write the final code inside the server.js file. So, here we have set the template engine to ejs. Now create a file called the welcome.ejs inside the views folder. Save the file and go to the browser and switch to the following URL. Now, we have successfully integrated the EJS template. Finally, How To Use Template Engines With Express Tutorial with Example is over. Thanks for taking.